It’s not just a flux capacitor that makes time travel possible– books also have the uncanny ability to take us to another time and place. 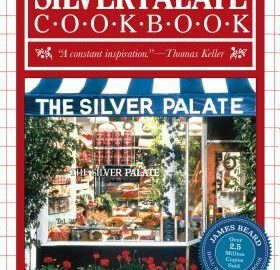 This month’s title, The Silver Palate Cookbook, brought us back to the 1980s: that Reaganesque decade of big hair, big shoulder pads, and big business. In the 80s, two nascent food trends converged to bring about an unprecedented expansion of food choices, both in restaurants and at the supermarket: the California-casual farm-to-table movement spearheaded by Alice Waters at Chez Panisse; and the New York upscale (dare I say yuppie?) style of new-wave French chefs like Daniel Boulud at Le Cirque. Both trends have produced long-lasting changes in the way we think about, produce, and prepare our food. 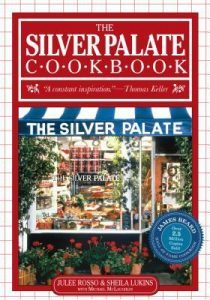 For us East-coasters, both Martha Stewart and the Silver Palate team of Julee Rosso and Sheila Lukins brought these trends to the home cook. But that was more than 30 years ago– have their innovations stood the test of time? It was obvious to all of us that this was an older cookbook– it has no full-color photos; in fact it has no photos of any kind! The illustrations are all pen-and-ink drawings, which some people enjoyed; but others missed the lush photography found in newer books. The overall layout of the book was easy on the eyes, and we enjoyed the authors’ amusing and/or informative sidebars found throughout. From a 2018 perspective, it was fun to read descriptions of, and recipes for, ingredients that were a novelty then, but are now found in any large supermarket (pesto, anyone?). Some in the group had well-loved copies of this title, and had fond memories of particular recipes they frequently made. Many had received this book as a gift, or had gifted copies to family and friends. And as you might expect from a cookbook based on the products of a gourmet shop, many of the recipes were for “fancy” or party food. 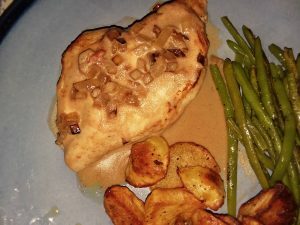 Some recipes were three pages long and took three days to prepare! We didn’t tackle any of those. A couple of people tried pasta dishes; Mr. Fussy inexplicably enjoyed the pasta puttanesca, which contains anchovies, an ingredient on many people’s “will not eat” list. Perhaps the spicy tomato-based sauce makes up for a lot? 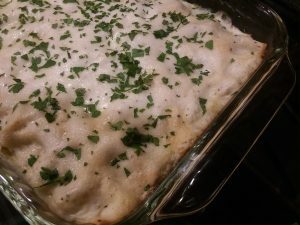 Another pasta classic, spaghetti with oil and garlic, somehow wasn’t flavorful– despite a healthy dose of garlic, the dish was “ordinary.” Green lasagna was a bit of work, as all lasagnas are; but it was enjoyably light and fresh despite plenty of cheese and a bechamel sauce. Vegetable purees must have been something novel and exciting in the 80s; this book has a (short) chapter devoted to them. One person made beet and apple puree, which turned out to be a tasty, fruity combination that wasn’t too beet-y, a plus for those of us who have a love/hate relationship with beets. Moving on to dessert, orange cake had plenty of its namesake flavor and a pleasant, not too dense texture, but “my own recipe is still better.” Toffee bars featured a shortbread crust topped with melted chocolate and chopped nuts; these were good but weren’t very toffee-ish (needed molasses or dark brown sugar? ), and the batter was quite stiff and difficult to spread in the pan. One baker in the group who has a long history with this title recommended the oatmeal raisin cookies and shortbread hearts (“great as a base for bars, or to dip in chocolate”). At our meeting we sampled raspberry muffins from The Silver Palate Good Times Book; these were tart and tasty with fresh raspberries and a streusel topping. Despite our many successes, most people felt that the book was somewhat dated. Food styles do change, and what was new and exciting to eat thirty years ago doesn’t necessarily entice us now. The party/fancy food focus of the book was a bit off-putting for some, and there were complaints that some recipes were scaled for a caterer rather than a home cook, and/or were overly meat-centric. So while it may be fun to wander down memory lane, most of us are content to leave this book on the history shelf! These opinions were, as ever, reflected in our voting: we averaged out to a 2.6 (out of a possible 5). More than half the group rated it a 2! Our next meeting will be a combined November/December meeting on Friday, December 7 at 11 AM in the Fireplace Room. 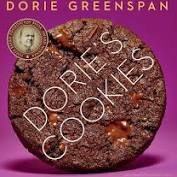 This month we’re baking our way through Dorie Greenspan’s Dorie’s Cookies. Copies are available at the main desk; all are welcome to join us. Hope to see you there!